MariaDB-5.5.21-beta is the first MariaDB release featuring the new thread pool. Oracle offers a commercial thread pool plugin for MySQL Enterprise, but now MariaDB brings a thread pool implementation to the community! If you are not familiar with the term, please read the Knowledge Base article about it. Read/write OLTP benchmark results will be published as soon as they are available. Let me add few more words about binding cpu cores and thread pool configuration. Sysbench-0.5 which was used for this benchmark, turned out to be quite a cpu hog; especially for high concurrency levels. 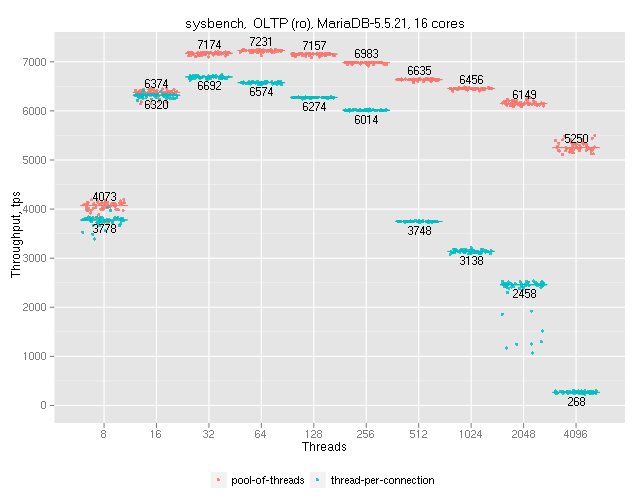 If both mysqld and sysbench are allowed to run on all cpu cores, they will fight for resources – which will result in artificially bad results with many threads. With 4 cores for sysbench and 20 for mysqld, sysbench itself became the bottleneck. So I ended with 8 cores for sysbench (leaving some room here) and 16 for mysqld. On UNIX, the MariaDB thread pool normally needs no configuration because it autoconfigures thread-pool-size to the number of cpu cores (this depends on sysconf(3) to implement _SC_NPROCESSORS_ONLN) which is in almost all cases the optimal size. If one binds mysqld to a subset of cpu cores, one should set thread-pool-size manually to the number of cpu cores given to mysqld. What kind of OS was used? Linux, unix or windows? But really, I though thread pools were commonstay in most DBs.. you’re telling me that a thread is CREATED and DESTROYED per connection normally? Strange. Dont confuse this with the already existing thread cache . . .
Thread pool is not about creating or destroying threads, but how requests (incoming SQL queries) are mapped to worker threads. Please check the MariaDB Knowledge Base for the details. Even the traditional thread-per-connection model will not necessarily create a new thread for a new connection, because there is the thread cache. See also here how MySQL/MariaDB handles connections and maps worker threads.
. . . Or with connection pooling on the client side . . .
How does this compare to the thread pool of MySQL Enterprise in terms of performance?